Happy Friday! Even though I am at home now, I still love the weekends as my favourite people get to stay home with us and laze around. Happy 8 month birthday Anjali-- post to follow shortly! Spring has officially begun but it is still snowing. Can you believe it? I certainly can't! It's time for me to bust out this new spring jacket that Darin bought me last weekend. We are in the process of firming up our plans for the summer-- and it is SO exciting! Once, they are finalized, I'll share them but let's just say, our family has never done something like this before. I've just begun posting T&C pictures. They are so much to sort through! To continue with more very soon. One night for the week has become Cassia/mama night, when the babysitter comes in. I take Cassia to dance and then we go have a meal and maybe run some errands. It's lots of fun spending time with my special girl! I am obsessed with these almonds!I have way more than the recommended serving size! Last day of skating for a couple weeks tomorrow as well-- I'm even more excited- no drama/ asking "Do I have to go to skating?" for at least a few weeks. While we're not fans of the skating, we're the teacher's pet in dance. 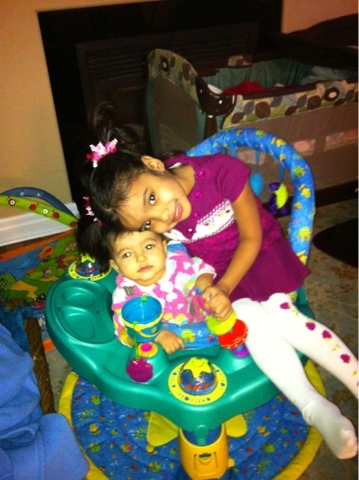 The girls are becoming very good friends and already Anjali likes to be around Cass, just watching what she does and doing her own thing next to her big sister.